Our Costa Bella line includes must-have items suitable for both leisure and those special occasions. The two-piece sets CHARLOTTE and DANIA, with their original prints, attractive colours and graceful lines, radiate femininity and delicately enhance a woman’s silhouette. DANIA blouse is printed both front and back on a vivid orange background with plain colour long sleeves providing an interesting contrast. The blouse has a round neck, opening in the back with a button fastening and side opening with invisible zip. DANIA straight printed trousers complement the look and enhance the female silhouette. Ankle length invisible zip side opening. Our CHARLOTTE printed top has an eye-catching asymmetric neckline with a thin strap and an elegant ruffle extending across the chest and back. Side opening with invisible zip. CHARLOTTE trousers are long and fluid printed pants. Side opening with invisible zip. The CHARLOTTE and DANIA prints are an original and exclusive design by Alba LAZARÍ. 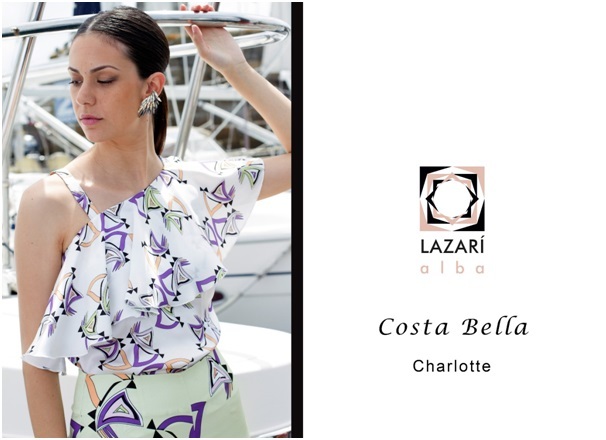 We invite you to visit www.albalazari.com to discover our Costa Bella exclusive creations from Alba LAZARÍ.